Porsche's new Boxster and Cayman | What Car? It's probably no surprise that Porsche chose car-crazy, but emissions-obsessed California to reveal the latest versions of the mid-engined Boxster roadster and Cayman coup. They offer something to both car nuts and environment-phobes more power and performance, but improved fuel economy and CO2 emissions. Contributing to this apparent paradox are a couple of new engines and an optional twin-clutch semi-automatic paddle-shift (PDK) gearbox similar to that introduced on the purists' Porsche, the 911, earlier this year. There's a 2.9-litre flat-six engine delivering 255bhp in the Boxster and 265 in the Cayman (increases of 10 and 20bhp). The direct-injection 3.4-litre unit introduced on the 911 a few months ago powers the S models. The Boxster S now has 310bhp (+15) and the Cayman S 320bhp (+25). Even so, all four now deliver better than 30mpg average fuel economy, and the base Boxster and Cayman no longer fall into the top road- and company-car tax brackets some consolation for buyers who work in the City who have had a hard time of it recently. The front and rear ends of both cars have been changed, though as Porsche has proved with the 911 down the years, it knows how to modify things while apparently letting them remain the same. There's also revised suspension and steering, wider wheels on basic models and bigger brakes on S versions. You get the latest version of Porsche's stability control system, which now incorporates features to reduce stopping distances in emergencies, and a limited slip differential is optional. Improved lighting and stereo systems and seats with ventilation as well as heating are among the new options. 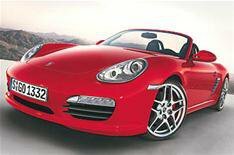 Prices span 34,420 for the basic Boxster to 45,020 for the Cayman S.